It is so strange. To be happy dancing twice in a week. 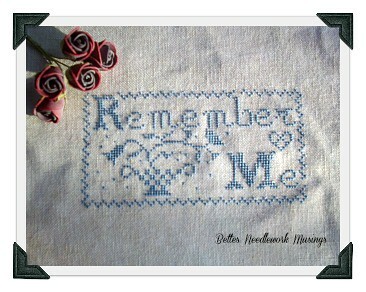 I chose to work on Blackbird Designs ‘Basket of Memories’, because I knew it would be a quick stitch. But knowing my track record, I was not sure if I would get it finished in the time I had set. It took a tad longer than I had hoped, but by Saturday night, I was stitching on Nostalgic Needle’s ‘Blue Rose Sampler’, a long term UFO in my stash. I have decided that I will stitch on this sampler in between shop models – just a couple of days here and there. This weekend I managed to complete the border as I did no stitching yesterday.